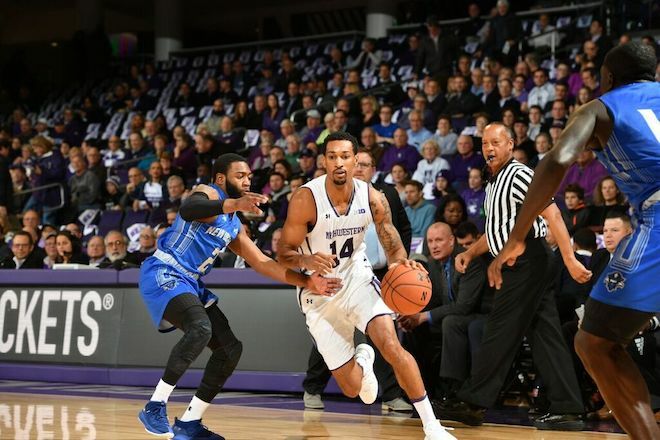 Three games into the season, Northwestern men’s basketball (3-0) looks sharp and appears to be finding its identity. Thus far, the team has looked elite defensively with a much more dynamic offense than we saw in the Bryant McIntosh era. In solid wins against three inferior opponents in New Orleans, American, and Binghamton, the Wildcats have enjoyed both strong play from their studs, and a few pleasant surprises. Here are the key takeaways from each game. Northwestern started slowly in this game before putting the pedal to the metal after halftime. In his first game in purple, Ryan Taylor had an immediate impact, leading the team with 20 points. Northwestern shot 30 (!) three pointers, making 36.7% of them. Ryan Taylor shot more from behind the arc (11) than the entire New Orleans team (10). Defensively, the Wildcats held the Privateers to 20% from deep. The majority of minutes were gobbled up by Vic Law, Dererk Pardon, A.J. Turner, Anthony Gaines, and Taylor. Highly touted forwards Miller Kopp and Pete Nance played a combined 26 minutes but disappointed, scoring just 12 points and pulling in 3 boards between the two of them. Northwestern committed just 9 turnovers. Being careful with the ball is going to be key for this offense come Big Ten play, and Chris Collins has emphasized ball security in postgame press conference thus far. Northwestern missed a lot of open shots, but did enough to win. Pardon and Law carried the team on both ends of the floor. Pardon brought down 18 rebounds - including 8 offensive rebounds - to secure his second straight double-double. Law, meanwhile, poured in 26 points. For the second straight game, the offense was heavily reliant on threes, with much less success this time around. The Wildcats shot 4-22 from beyond the arc, and were lucky that American did not fare much better after coming out hot. Also for the second straight game, Northwestern had just 9 turnovers. They were particularly good in this regard in the second half, preventing American from a realistic shot at a comeback. This was Northwestern’s most dominating win, especially considering that Binghamton went on a 19-2 run in the middle of the second half. The ‘Cats shot 51.6% from the field on the night. Given that the game was over by halftime, minutes were much more evenly distributed. Nine players played double-digit minutes. Junior Barret Benson was the best of the bench players, picking up his first ever double-double in 27 minutes of play. There is no McIntosh to rack up assists, but the offense was flowing smoothly and efficiently. Five different players had 3+ assists. Northwestern turned in another great defensive performance in allowing just 54 points. The ‘Cats rank 10th in the country with 52.3 points allowed per game.